The “Event Log” button displays a dialog that shows events related to the gateway which have been logged to the Windows Event Log. The gateway always logs when its services are started and stopped. Additionally errors are reported to the event log if a particular SMSC interface fails to initialize, and when a user account exceeds their defined message quota for sending messages. These events can also be sent by NowSMS to one or more e-mail addresses to alert system administrators of potential problems. To configure these alerts, press the “Manage Alerts” button. As the alerting function uses e-mail, and all e-mail functionality within NowSMS is provided by the MMSC Service, this functionality requires that the MMSC Service be activated. 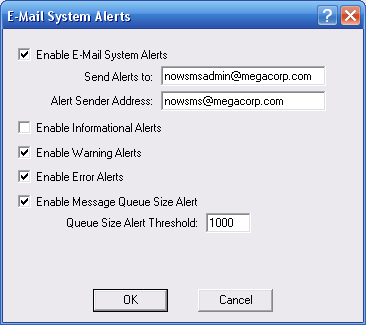 Check the “Enable E-Mail System Alerts” button to enable e-mail alert functionality. The “Alert Sender Address” field specifies the address that will appear as the “From:” address in alert messages. Check “Enable Informational Alerts” to enable alerts for informational events generated by the NowSMS gateway. Examples of informational alerts include start-up and shut-down messages when the NowSMS services are started or stopped, as well as when an SMSC interface is successfully re-initialised after an error condition has occurred. Check “Enable Warning Alerts” to enable alerts for warning events generated by the NowSMS gateway. Examples of warning alerts include user accounts exceeding their allocated messaging quotas, as well as SMS messages being rejected by the upstream SMSC connection. Check “Enable Error Alerts” to enable alerts for error events generated by the NowSMS gateway. Examples of error events include failure to connect to a configured SMSC, failure to start a service due to TCP/IP port conflicts. Check “Enable Message Queue Size Alert” to define a “Queue Size Alert Threshold”, where an alert will be sent if the number of messages in the outbound SMS messaging queue exceeds the defined threshold.